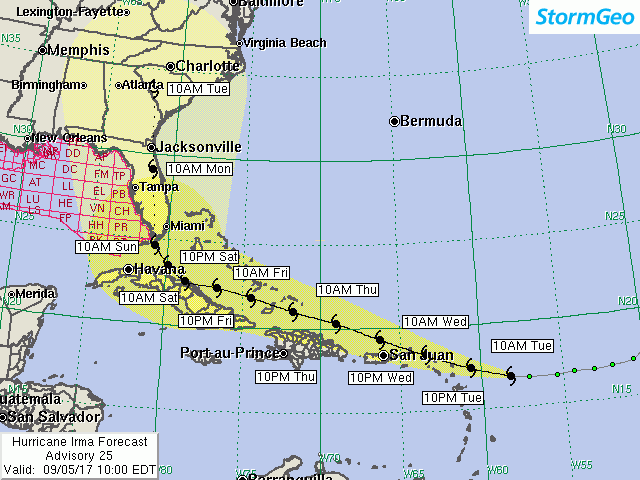 Crowley’s Corporate Emergency Management team continues monitoring Hurricane Irma, which has strengthened to a major Category 5 hurricane as of Tuesday morning, threatening the Caribbean Basin.The hurricane also could create potential impacts along the U.S. Gulf Coast, Florida, as well as the coasts of Georgia, North Carolina and South Carolina, based on current forecasts. Safety is Crowley’s No. 1 core value, and as such we are taking all appropriate steps to ensure the safety of personnel, including our mariners, all of our vessels and your cargo. We are coordinating with our vessels, and they are being directed to review their routes and plans to keep them well clear of the storm. Our Crowley team also is making appropriate preparations at shore-side facilities to protect the safety of personnel, equipment and cargo. At this time, we expect disruptions with many of our services, including those involving the Leeward Islands, the British Virgin Islands, the U.S. Virgin Islands, Puerto Rico, Jamaica, the Dominican Republic, Haiti, Cuba, the Caribbean Islands and Central America. Our St. Thomas and St. Croix offices are closed today and tomorrow. Although our San Juan, Puerto Rico terminal is currently open, it will close at 1400 EST Tuesday afternoon in preparation for the hurricane. San Juan is expected to be closed Wednesday as well. Port Everglades, Fla., remains open but it is expected to be set under condition Whiskey this afternoon. This means that gale force winds are expected in the next 72 hours. If the storm continues its present track, we expect further changes in port status as early as this afternoon. As the trajectory of the storm continues to develop, we will update you with further information. For the latest information on our sailing schedule, please visit Crowley.com.